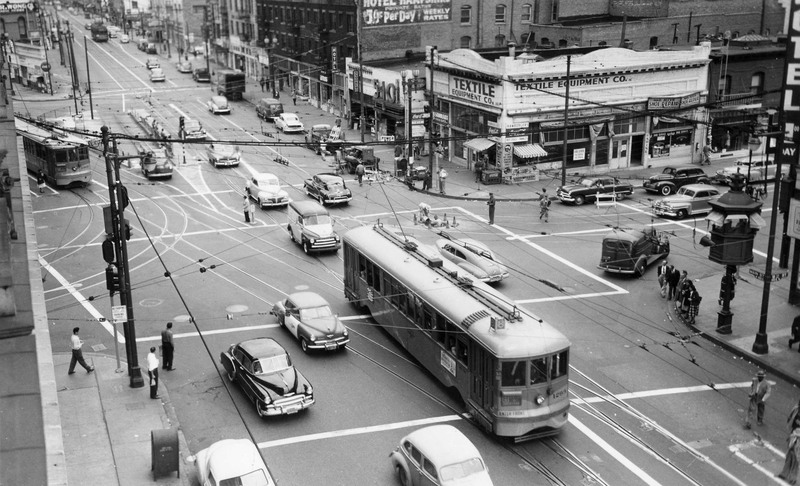 At the very busy intersection of Main – Spring -& 9th Streets, an old Los Angeles Railway manned pole tower (right) kept streetcar switch movements running smoothly. In the shot taken on May 23, 1950, Los Angeles Transit Lines car no. 1293 heads south on Main Street working the 8 line. Waiting to make to right turn from Spring St, onto 9th is LATL car no. 1307 working the N line. In the distance, a PE car on the Watts-Sierra Vista line can be seen heading north on Main St. 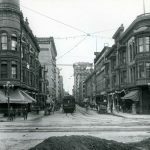 Soon, the N and Sierra Vista lines would be no more. Great photograph! Thanks for sharing. Very cool. I remember the pole towers but never knew what they were for. Now I know! Judging by what’s across at the corner, “There’s a Ford in your future” was far more than an ad slogan! It was a warning of what was about to happen.